After you’ve set up your account and specified your branding, you can now start creating and scheduling campaigns with Missinglettr. First of all, here's an explanation of the term "campaign" if you're not quite sure what it means. Missinglettr will detect your past blog posts as well (if your RSS feed allows that). The Waiting tab contains all the campaigns you can create. That means Missinglettr will take the blog post you pick and create a drip campaign for it. You can click “Create campaign” to pick the specific post, or “Reject” if you don’t want to create a campaign for that post. After you’ve clicked “Create campaign”, Missinglettr can take up to 30 minutes to give you an output. You will receive an email notification when the process is done. Reviewing a campaign means you have full control over what is posted to your social media accounts. There are 3 simple steps in this process. First, make sure you like the hashtags Missinglettr has picked. You can add your own or turn them off altogether. Moving a hashtag higher in the list increases its priority for being assigned to posts. Once you are happy with hashtags, click the “OK, let’s review content >” button and it will lead you to the next step. Moving to the “Content review” tab will allow you to take a look at the picture-text combos we have prepared for you. You can switch between the options using left and right arrows, or you can edit the text and upload custom photos of your own. Please note that Missinglettr uses the images from your blog posts along with creating image quotes. So, make sure your blog post is packed with relevant images. 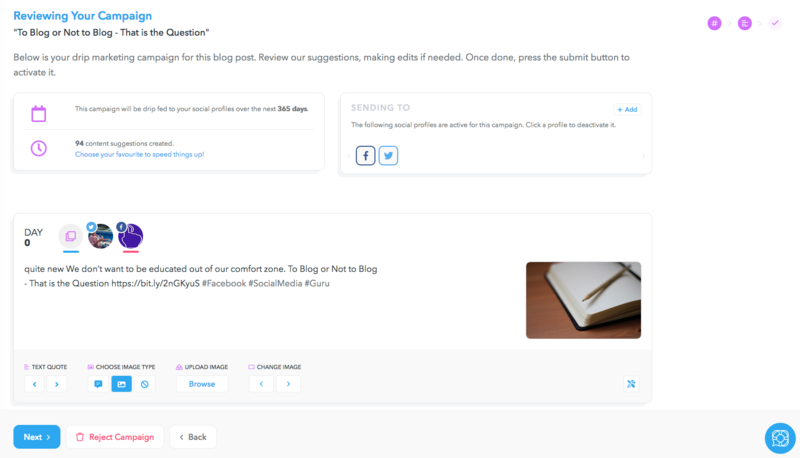 You’ll be shown a timeline here and you can choose to make your campaign have more or less posts over the year. If you scroll down, you will see each of the posts within the campaign. The main thing to notice here is the possibility to use the quote image, an image from your site (or an uploaded one) or just text. 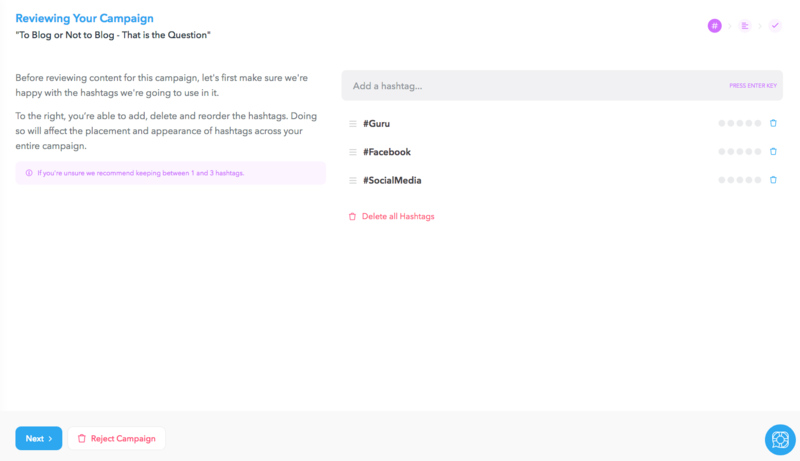 When editing a post of a campaign, you are given the possibility to edit the text of the quote image, text of the content, the assigned short links and even hashtags. Once done editing, click Save to apply your changes. At the bottom of the page, you can either approve or reject the campaign. This process is a bit different for Facebook posts since this platform does not allow third parties to post pre-populated content on your behalf. That’s why you have to review each Facebook posts and decide whether it can be posted to your profile/page or not. Yes, this takes a bit more time, but that’s what the Facebook policies request. You can find a guide for Facebook approval here. 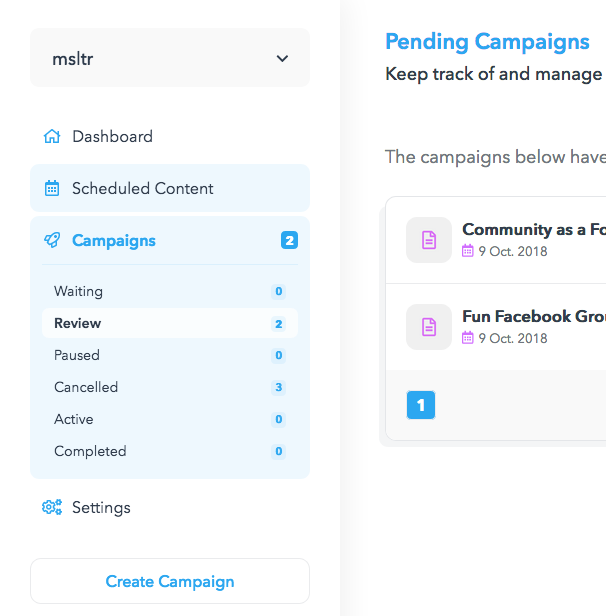 After you’ve approved the campaign, it will move to the “Active” tab and start sending posts out to your social media accounts at scheduled times. At any time, you can pause or cancel active campaigns. On your menu line, there is the “Scheduled” tab where you can see exactly when your posts will go live. Next: How to determine the schedule for my campaigns?